The admissions committee considers various criteria in the acceptance of new students. Listed below are some of the more important criteria. All other admission priorities will comply with the admission policy of the Diocesan school office. Entrance Age - No child will be admitted to Kindergarten unless he/she has attained the age of five (5) years on or before September 1st of such school year. No child will be admitted to Pre-Kindergarten unless he/she has attained the age of four (4) years on or before September 1st of such school year. All new families must attend a mandatory orientation meeting with the Pastor. Documentation of the state required immunizations plus a birth certificate, baptism certificate (if applicable) and a social security number are to be presented at the time of registration of all beginning students and transfer students. A recommendation from student’s previous school is required of all students. The Catholic schools in the Diocese of Little Rock admit students of any race, color, national and ethnic origin to all rights, privileges, and activities generally accorded or made available to students at the school. Catholic schools in the Diocese of Little Rock do not discriminate on the basis of race, color, national or ethnic origin in administration of its educational policies, admissions policies, scholarship and loan programs, and athletic and other school-administered programs. Christ the King staff is committed to meeting the needs of all students, in so far as possible. There are some conditions, however, for which the school cannot provide the necessary resources. The great truths of the Catholic faith must be taught in the home by parents - first by example, then by precept. Family prayer should be emphasized, for it is one of the surest ways to develop a consciousness in children of the abiding presence of God. Christ the King School admits students of both sexes, of any race, color, national or ethnic origin. In compliance with state law and diocesan regulations: “No child shall be admitted to kindergarten unless he has attained the age of five years on or before September 1st of such school year. If the child is a Catholic, a baptismal certificate must be presented at the time of registration. All non-Catholic students must present a birth certificate, previous school records and schedule an interview with the principal and/or pastor prior to acceptance and admission. Current immunization records in accordance with Arkansas law must be provided at the time of registration. or Tetanus Diphtheria (TD adult) at least three doses of Polio vaccine; two doses of Rubeola (measles) vaccine, one dose of Rubella (German measles) vaccine and one dose of Mumps vaccine. Additionally three doses of Hepatitis B vaccine and one dose of Varicella (chickenpox) vaccine are required before entering Kindergarten. Three doses of Hepatitis B are required for Transfer students (students not enrolled last school year) and students entering the seventh grade. From Diocesan Policy 5.22 TRANSFER STUDENTS • Permanent record/transcripts and immunization records are required for admission of transfer students. If records have not been received within thirty (30) days after accepting a transfer student, the school may dismiss the student. • Students accepted are on probation, both academically and socially. • Students transferring to secondary schools and participating in sports must follow the guidelines set forth by the Arkansas Activities Association (AAA). • Permanent records and high school transcripts may be withheld by the principal in the event a student has not completed the withdrawal process and cleared financial accounts. Each school should have a policy regarding collection of unpaid fees and tuition in its student handbook. • Schools will forward a student’s educational records to other educational institutions that have requested records, provided all financial accounts have been cleared. When a family is moving or withdrawing from school for any reason, the parents must complete and submit a withdrawal form to the school office stating the reason for leaving and the planned date of departure. The same procedure should be used if the family is not returning for the next school year. The student’s classroom place is not released until the school has been officially notified in writing of the student’s withdrawal. Each month the School Board examines the budget and financial report for the operation of Christ the King Catholic School. In the Spring of each year a new budget is put together by the Principal & Finance Officer, working in cooperation with the School Board Finance Committee. This budget is then approved by the School Board and Parish Finance Council. It is during this budgeting process that increases in tuition are decided upon along with any other financial adjustments. Families are then notified of the assessment for their family, depending upon actual number of children enrolled. This Schedule includes families who are not only registered members of Christ the King Church but who also have a record of regularly attending mass and supporting Christ the King Church by the use of Church envelopes. It does not mean a set amount of contributions. And as each family is encouraged to actually budget their contributions monthly, the consistency of their support will determine their tuition rate. Our policy is that each family should look at what the “average” contribution is – ($950/year) – and make that the benchmark for their own contributions to the Church each year. We realize that for some families, that figure is beyond their capability; then they should do their best before God. And while for those families that do give the average and well above it, they need to continue their generous giving. Also included in this Schedule are those who are members of the Cathedral parish, St. Bartholomew parish, and every other catholic church not currently associated with a catholic school. Those included here must obtain a written confirmation from their pastor that they are active members who financially support their church. This schedule includes Catholic families who are not registered members of Christ the King Church. It also includes members of Christ the King Church for whom there is no record of regular mass attendance and support of Christ the King Church by the use of Church envelopes. This schedule includes families who are not members of the Catholic faith. As part of the annual enrollment process for new and returning applicants, each family’s record of contribution and mass attendance will be re-evaluated at registration to determine the Schedule of Tuition for the new school year. Tuition for each academic year will be based on families’ records from the previous year. We encourage you to consider making contributions to the Church by way of the electronic funds transfer (EFT). If you choose this method of contributing, you are encouraged to write “EFT Family” on the front of the giving envelope and place your empty envelope in the offering basket as usual. Christ the King will continue to support a discounted tuition scale for Catholic families who have multiple children enrolled in the school. However, the percentage will be reviewed on an annual basis by the School Board, working in concert with the pastor and principal. In no year will the discount by lessened by more than five percent. This tuition policy acknowledges that Christ the King Church will continue to provide ongoing financial support of the School as it has for the past twenty years. 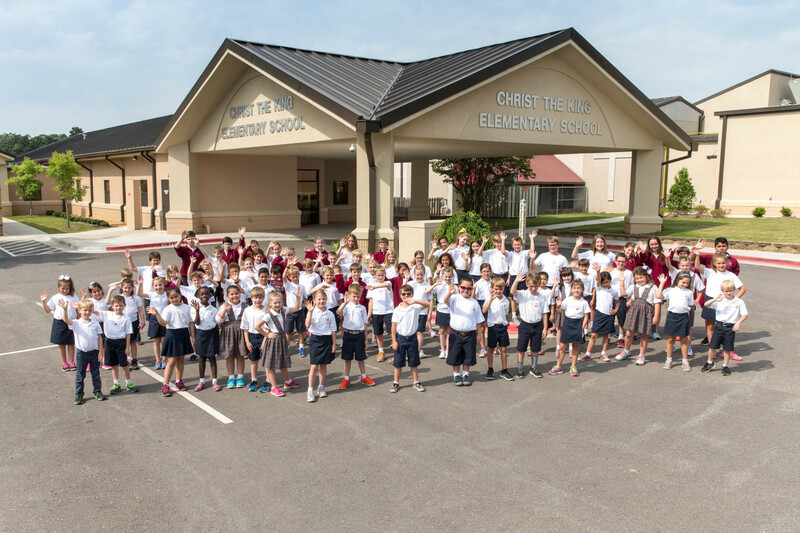 It is this ongoing support that allows Christ the King School to provide tuition rates that are affordable, supporting the Catholic Church’s commitment to the mission of providing a Catholic education in a quality environment. An underlying presumption of this support is that Catholic families also contribute to the life of the Church by way of their time, talent and their treasure. This policy allows Christ the King School to benefit directly from the financial support of the Church and the contribution of the Catholic family to Church life in order to determine the appropriate tuition Schedule for all families. No child or family of Christ the King Church will ever be asked to leave Christ the King School, nor will pressure be applied to remove their children because of their inability to meet any financial obligation. There are some families who apply for scholarships each year, and they should continue to do so. However, if they do not have a record of regularly supporting the Church, they will not be eligible for scholarships. If and when emergencies occur within a family that jeopardizes their ability to pay tuition – they are strongly encouraged to contact Monsignor Malone personally for assistance. It has been a policy of the Little Rock parishes for about 25 years that should a family attend a Catholic Church in the Little Rock/North Little Rock area on a given weekend – if they use their own Church envelopes, those envelopes are mailed back to the parish. In other words, if you attend Holy Souls and drop in a CTK envelopes, Holy Souls will mail it back to CTK. If you have any questions regarding this policy, please direct them to either Msgr. Malone (msgrmalone@ctklr.org) or Kathy House (khouse@cktlr.org). The Registration Fee is refundable if the school is notified that the child will not attend school by June 1 prior to the next school year. If the family is relocating then the registration fee is refundable after June 1. The obligation to pay Annual Tuition is for the entire school year. No portion paid or outstanding will be refunded or cancelled except upon proof of illness, job relocation, or other good cause shown. In all other cases of absence, withdrawal, suspension or dismissal, the school reserves the right to settle, compromise or waive a Student’s Annual Tuition obligation in such manner as it shall deem advisable in its sole discretion. The one-time Building Fee is non-refundable except if the student does not attend school. Book, Facility, PTO fees are not refundable after June 1. All books for the current school year must be paid in full before scholarship funding will be considered for the following academic year. SHOULD A FINANCIAL CRISIS OCCUR AFTER REGISTRATION AND YOU ARE UNABLE TO MEET YOUR OBLIGATION AN IMMEDIATE CONFERENCE WITH THE PASTOR SHOULD BE SCHEDULED. Textbooks are issued on a rental basis and must be checked in at the end of the school term or before withdrawal. Any student who loses or damages a book shall replace it at full cost. ALL STUDENTS ARE REQUIRED TO COVER HARDBACK BOOKS PROVIDED THROUGH THE RENTAL SYSTEM. (DO NOT USE CONTACT PAPER TO COVER HARDBACK BOOKS. WE DO RECOMMEND YOU USE CLEAR CONTACT PAPER TO COVER ALL CONSUMABLE BOOKS AND FOLDERS.) All students are required to have a bookbag for carrying books. Consumable books and materials must be purchased. If for any reason a parent wishes to purchases a textbook, this may be done: however, the book rental fee must also be paid. Incidental Fees, such as Book Fees, Facility Fees, Athletic fees, PTO fundraisers, and cafeteria charges are billed through the family’s FACTS Management Company tuition account. Parents will set up a FACTS Management Company account to make payments for all tuition and fees. Payment plans include Monthly (August through May), Semi-Annual (August 1 and January 1) or Annual (August 1). After setting up the FACTS tuition account, parents can log on at any time and view payment history, see the next scheduled payments, change financial accounts, make a payment online and print out statements for tax purposes. Any student whose tuition account becomes more than 30 days past due may be subject to action as stated in the Delinquent Tuition Policy (see below). Students of families who fail to meet their financial obligations MAY NOT BE ALLOWED to register or attend the following school term. If there is any doubt that you will be able to meet your financial obligations, IT WILL BE ESSENTIAL THAT YOU REQUEST A CONFIDENTIAL TUITION AID FORM AT THE TIME OF REGISTRATION. SHOULD A FINANCIAL CRISIS OCCUR AFTER REGISTRATION AND YOU ARE UNABLE TO MEET YOUR OBLIGATION, AN IMMEDIATE CONFERENCE WITH THE PASTOR SHOULD BE SCHEDULED. If your tuition and/or fees are 30 days late, the finance office will send a statement requesting immediate payment. If you do not respond to this attempt to collect, your account will be communicated to the Pastor for resolution. At CTK, we value our Catholicism and traditions above all other things. Our uniforms are our first opportunity to make an impression on those who see us, and as such are the most apparent expression of our commitment to modesty, safety, and a distraction-free learning environment. We believe that our dress code policies contribute to a positive school, and provide a level playing field to our students, free of the judgment which may be a byproduct of fads, fashion trends, or socioeconomic factors. Our uniforms and dress code also provide safety from clothing which may be a hazard on the playground, as well as provide us a means of quickly identifying people who may not belong on school grounds. Intermittent uniform checks will be conducted and disciplinary action will be taken if necessary. Persistent violations will result in progressive disciplinary action. The Toggery is the official uniform store of Christ the King School. The Toggery is located in Pleasant Ridge Town Center, at 11525 Cantrell Road. Their telephone number is 227-8492. Students are encouraged to wear belts. ONLY PLAIN WHITE T-SHIRTS MAY BE WORN UNDER THE UNIFORM SHIRTS! NO “SAGGING” - SLACKS AND SHORTS MUST FIT AT THE WAIST! Blue jeans or jean - cut slacks are NOT allowed. Pants must be worn Dec. 1- March 1. Shorts are allowed Aug. - Nov. and March - June. T-shirt Fridays –School Spirit shirts in school colors (white, burgundy or gray only) can be worn on Fridays. Shoes for students are required to be “tasteful” and appropriate for school wear. Boots and cleated shoes are not allowed because they cause floor maintenance problems. Only shoes with non-marking soles are allowed. Boots of any kind, clogs or sandals (open toe or open back) may not be worn ever. No skating shoes are allowed on school grounds. ONLY TENNIS SHOES WILL BE ALLOWED ON THE GYM FLOOR. Jewelry should be kept to a minimum so as not to detract from the uniform. Necklaces are not allowed to be worn at school. Expensive jewelry is not permitted. Hair barrettes, bows, ribbons, headbands, and earrings should be modest in size and style. (No dangling earrings). Colors should coordinate with school uniform. No earrings for boys. Only a watch and ONE bracelet/band can be worn. NO MAKE-UP, SPRAY TAN, VISIBLE TATTOOS, FAKE NAILS, OR COLORED FINGERNAIL POLISH IS ALLOWED. Casual Day attire should be in good taste. If shorts are worn they must be uniform shorts (only allowed in August-November and March until the last day of school). No tank tops, jeans with holes, or mini-skirts allowed. Leggings must only be worn under a dress, skirt, or a top of appropriate length.. Objectionable or rude words (i.e. beer T-shirts) are NOT allowed on shirts worn on Casual Day. Items of clothing deemed objectionable will be held in the principal’s office until the end of the school year, and parent will be called to office to change item of clothing. Work boots and sandals may not be worn. Uggs may be worn on Casual Day only. Generally, clothing should be in good taste and appropriate for a Catholic school event. Specific details regarding type of attire may be sent out in advance of the event. Skirts and dresses should be of modest length. Halter style, tank top, off-the-shoulder, see-through, low-cut, cropped or backless tops and dresses are not permitted. The final decision for appropriate attire will rest with principal or vice principal. IF YOUR CHILD IS IN VIOLATION OF THE DRESS CODE, DISCIPLINARY ACTIONS WILL BE TAKEN. For both boys and girls, hairstyle shall be worn in appropriate manner and never extreme. Boys are expected to maintain a hairstyle with no less than one-half of the forehead and all of the ears visible. The hair in the back should never drape over the collar. Beards, mustaches, and sideburns are not allowed. Girls’ hairstyles must be so arranged as to be off the face and out of the eyes. Dyed hair is not permitted. The final decision for appropriate hairstyle will rest with the principal. If any of the above rules are violated, a note will be sent home to the parent and the student will be given 1 week to remedy the problem. If the problem is not remedied at that time, the child will be sent home and not allowed to return until the violation is remedied.